Millbrook Methodist Church & Pride of Wallace Tent I.O.R. (Independent Order of Rechabites ) Honour Roll commemorates those who served in World War One. 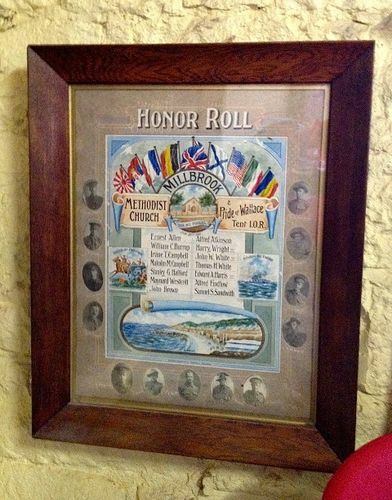 The decorated framed honour roll features the flags of allied nations and a painting of the church as well painted scenes of the attack at Pozieres, the sinking of the Emden and Anzac Cove. The outer edge of the roll contains photographs of the enlisted men. METHODIST CHURCH & Pride of Wallace Tent I.O.R.